I lucked out. When I finally had time to catch Holiday Hoopla 2016, I arrived on a night when talented Columbus State students were offering American Sign Language interpretation. It was beautiful effort. Not content to have a single interpreter gesticulate from the side of the stage, Shadowbox Live and Columbus State had worked out something far more elaborate. During the sketches, nearly every character was represented by a separate interpreter who took on that person’s personality while signing his or her lines. During the songs, interpreters swayed gracefully with the music while signing lyrics that even hearing patrons sometimes had trouble picking out. Obviously, sign interpretation is most valuable for those who rely on it to understand the action, but I enjoyed it as a variation on a show that has been sticking to the same format for most of the past quarter century. Even without the interpretation, though, this Hoopla has much to recommend it. Yes, most of the songs have been repeated annually for years, but they’ve become such an integral part of this local tradition that leaving them out would be unthinkable. A jazzy Merry Christmas Baby (sung by Stacie Boord), a bleak Hounds of Winter (sung by Leah Haviland), a forlorn The Old Man (sung by Stev Guyer): All are as gorgeous as they are indispensable. Most important of all are the rousing instrumental Christmas in Sarajevo and the gospel-like Children Go Where I Send Thee. My only comment on the latter is that this year’s version could be even bigger, with still more singers added as it builds to its soul-stirring finale. Among the skits, there are the expected duds and near-duds. One of them is the first, Your Own Personal Santa, in which a neighborhood meeting turns into a gripe session on parents’ odd Christmas traditions. Better is the following skit, Ancient Aliens, in which an eccentrically coifed Jimmy Mak shares his theory that Santa Claus is capable of superhuman feats because he actually hails from another planet. 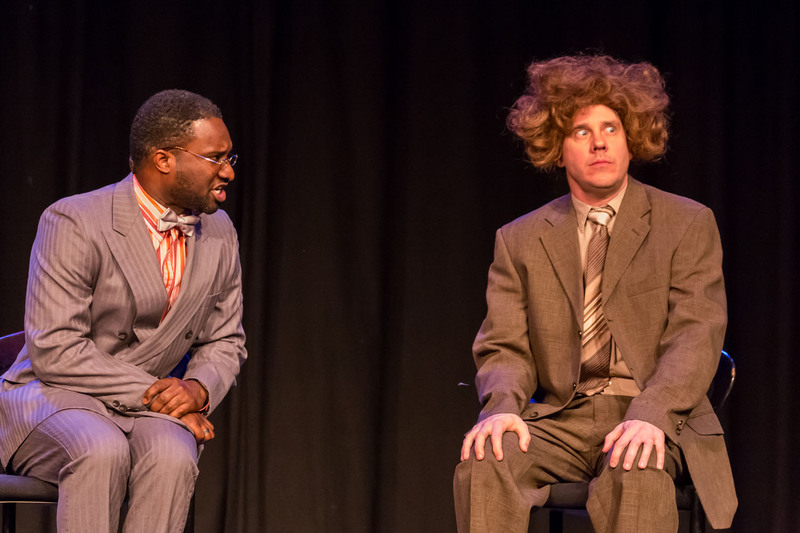 In general, the sketches get better as the show goes on, particularly after intermission. The Firstest Christmas, in which elementary-school kids present a musical depiction of the holiday’s roots, improves on a familiar Shadowbox theme by adding a satirical edge. Because they’re students at a Montessori school that refuses to rein in children’s creativity, teacher Mrs. Boddington (Katy Psenicka) is helpless to object when the kids stray from biblical accuracy. For instance, they have Mary (Haviland) arrive at the stable riding a certain red-nosed reindeer rather than a donkey. And, oh yes, the stable is located, not in Bethlehem, but at the North Pole. More satire is invoked in Xmas Do Not Play List, about a radio disc jockey (David Whitehouse) who’s ordered to stop playing a slew of familiar Christmas tunes for fear they’ll offend viewers with precariously thin skins. A series of short skits is built around a fictitious line of Hallmark “Honesty” cards that replace generic greetings with messages tailored to very specific—and very unpleasant—situations. Like the show as a whole, these get better as they go along. As always, the Santa Babies (Julie Klein, Stephanie Shull and Boord) finish things off with their kitschy lounge act. Highlights include a seasonally adjusted and beautifully harmonized version of Boogie Woogie Bugle Boy, a dry-land synchronized swimming routine and the It’s Raining Men finale. Then there’s the inevitable moment when they drag a male customer onstage in a suggestive routine that’s been repeated with nary a variation for the last 25 years. Watching this has long since become a tedious ordeal for me, but everyone else at the performance I attended seemed to be busting a gut. One more tradition we can expect to return in Holiday Hoopla 2017. Holiday Hoopla continues through Dec. 30 at Shadowbox Live, 503 S. Front St., Columbus. Show times are 7:30 p.m. select Mondays-Thursdays, 7:30 and 10:30 p.m. select Fridays-Saturdays. Running time: 2 hours (including intermission). Tickets are $25-$40. 614-416-7625 or shadowboxlive.org. The audience for Holiday Hoopla’s opening night may have been a bit small, but what it lacked in size, it made up in lack of spirit. Skit after skit drew only titters, leading me to wonder whether it was simply too early for folks to get in the Christmas spirit. After all, we hadn’t even made it to Thanksgiving yet. Then again, maybe the patrons were already suffering from seasonal affective disorder, courtesy of an early blast of wintry weather. Of course, one can’t discount the possibility that the main problem was the material, which is neither great nor fresh. Much of the show is very familiar, and the skits that aren’t familiar are short on comedy. The biggest dud is Cookie Party, the tale of a holiday family get-together. You could call this the classic example of a piece with more funny characters than funny lines except that the characters aren’t all that hilarious. Slightly more success is enjoyed by the three skits featuring Santa Claus (David Whitehouse). The best of them is Elf Reflection, in which St. Nick’s helpers watch a Lord of the Rings movie and come to the conclusion that they aren’t talented enough to be real elves. It’s a clever premise, but it needs more laughs to make it a winner. One of most familiar skits is Kidsmas Carol, in which a harried teacher (Stephanie Shull) tries to shepherd a cast of grade-schoolers through a performance of A Christmas Carol. The few chuckles it generates are mostly provided by Julie Klein’s spunky portrayal of the girl playing Scrooge. Maybe we’ve seen this chestnut once too often. Yet familiarity doesn’t always breed contempt. 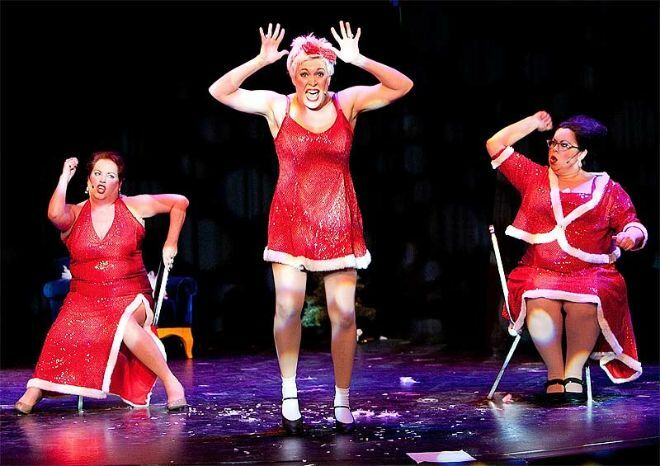 The biggest laughs on opening night were produced by the Santa Babies, a comically bad lounge act featuring Klein, Stephanie Shull and Stacie Boord. True, they offer little variation on the shtick they’ve been doing for years, but that seems to be good enough for many. And it was plenty good enough for a group of kids sitting near me, who cracked up every time the flirtatious Dolly (Boord) showed off her spankies. Personally, I wish the Santa Babies would vary their routine more from year to year. Meanwhile, I like them best when they play it straight, cranking out harmonies worthy of that swing-era act known as Andrews Sisters. Even without those rare moments, Hoopla has an abundance of good music. And unlike the comedy, it doesn’t lose its effectiveness when it’s been heard in previous incarnations of the show. Children Go Where I Send Thee (sung by Klein), The Old Man (sung by Stev Guyer), The Hounds of Winter (sung by Leah Haviland), Oi to the World (sung by Amy Lay and Haviland): It wouldn’t be Hoopla without these returning classics. Other entertaining tunes include James Taylor’s version of Jingle Bells (sung by JT Walker III), the BillWho? band’s metal version of Sugar Plum Fairy (from The Nutcracker), Lullay Lullay (sung by Nikki Fagin) and I’ve Longed for Christmas (sung by Boord). Speaking of which, Holiday Hoopla 2014 should go over better once the audience actually starts longing for Christmas. But it wouldn’t hurt if Shadowbox worked on improving the product in the meantime. 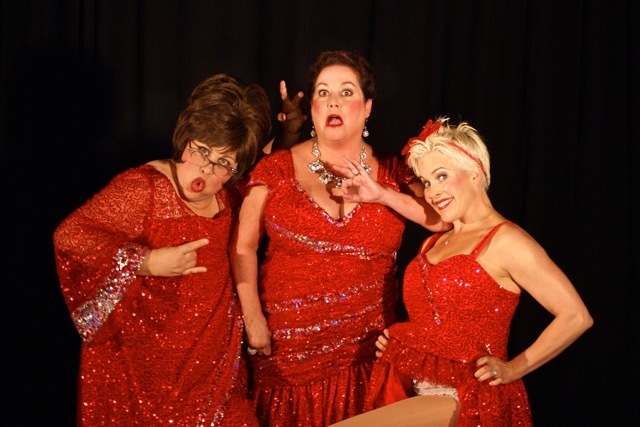 Holiday Hoopla continues through Dec. 27 at Shadowbox Live, 503 S. Front St. Show times are 7:30 p.m. select Tuesdays-Thursdays, 7:30 and 10:30 p.m. select Fridays-Saturdays, plus 7:30 p.m. Dec. 22 (no shows Nov. 25-27 or Dec. 24-25). Running time: 2 hours (including intermission). Tickets are $20-$50. 614-416-7625 or shadowboxlive.org.